Eating out in the USA is a standard. Sadly the availability of healthy food on a reasonable pricing is struggle and anything but easy. During my stay in New York I had the pleasure to meet the founders Sam and Jordan, who told me about their healthy mission and vision.. 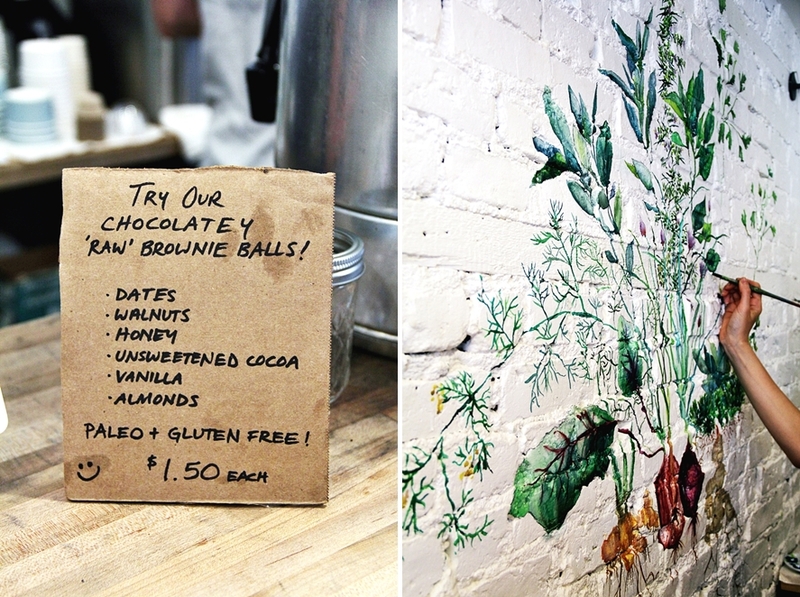 Located in, 90 W. 3rd St., New York, NY one will find Springbone Kitchen. 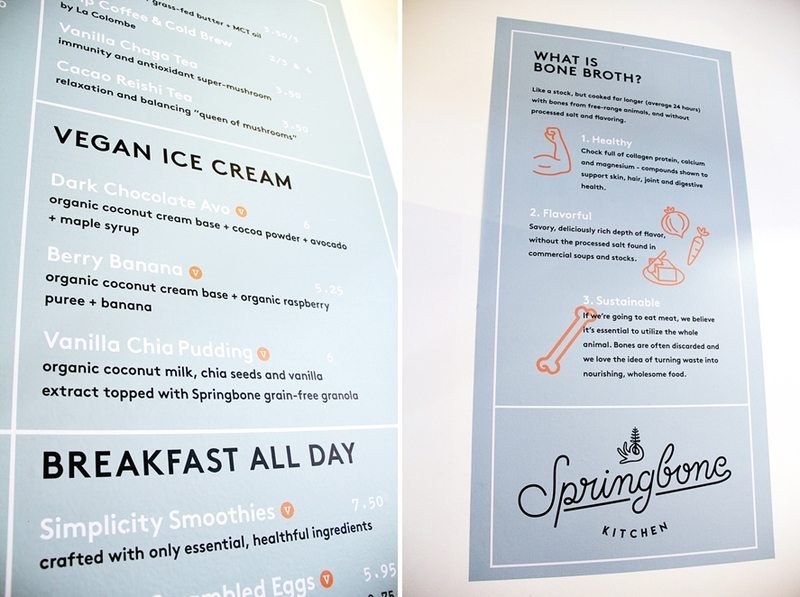 Springbone is the missing gap in-between juice detox and the unhealthy food options. Instead of just following a trend, the founders of Springbone wanted to deliver achievable food for the crown on a pricing that is affordable and food that is not only "good" but will also give one's body what it needs. The menu is made up almost entirely of organic vegetables, fruits and 100% free-range/grass-fed meats. One won’t find suspicious oils or fillers anywhere in our kitchen. Even the vegan ice cream is uncompromising, made with frozen avocado and sweetened with raw local honey. The signature is however the broth, which is so delicious that I hardly couldn't believe it myself. Usually I remember broths to have a high salt intake and a very oily and fatty surface. I had the pleasure to be pampered with a vegan broth at Springbone and it was different from all expectations and past experiences. 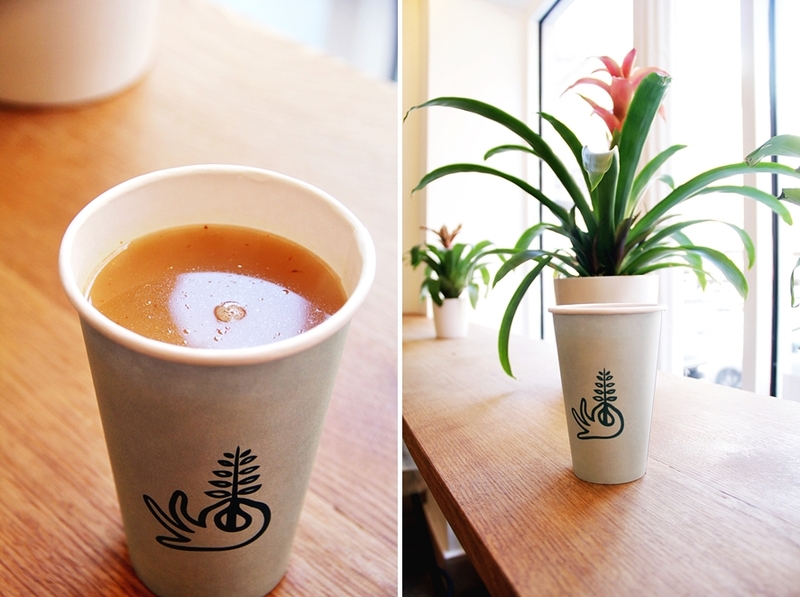 The broth prices start at $5. The concept and the design of the shop it as unique as the whole concept. It is the missing piece within the healthy fit food society in New York. Not only the founders are totally against diets and want to promote a healthy lifestyle, also an idea of healthy food and its production is given. Costumers also have to chance to buy granola at the shop and products in cooperation with other inspiring brands. Beside my vegan soft ice (-cream), I also had a terrible good chia pudding with the homemade granola which is to die for. One can taste the good food quality and that the food is fresh. I think fresh ingredients are important, since grains are basically the main part of the typical American dish, from what I (sadly) experienced. Springbone with its wide menu is definitely a great food choice to eat healthy on travel, on the go and a cleaver escape out of the American fast food jungle, with pizzas and fried food. I highly appreciate the pioneering spirit of these two young guys who definitely brought a change into this world with their unique idea of slow food, healthy options and fresh ingredients.